With traditional “strip surgery” hair transplants, or follicular unit transplantation (FUT), the doctor removes a strip of scalp tissue from the donor area and closes the surgical site with sutures. This hair transplant technique has a number of drawbacks including significant scarring and pain. Instead, men may want to consider undergoing a “follicular unit extraction” (FUE) hair transplant with minimally invasive robotic hair harvesting. 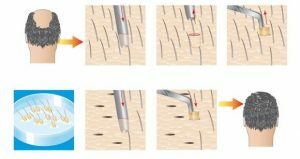 The robotic hair transplant technique is the most advanced system available today and it has revolutionized the donor hair identification process. With this hair loss solution, artificial intelligence algorithms identify the specific donor follicles to be extracted in such a way that preserves the natural appearance of the donor site. When it’s time to extract the individual grafts, the robotic system maintains the high quality of the grafts throughout the entire procedure, regardless of how many grafts are extracted. With the robotic hair harvesting system, the procedure can be performed faster, more accurately, and with better results.